Progressive jackpot prizes are always tempting targets for all casino players around the world. When you enter any physical or online casino, you will see the progressive jackpot meter showing the progression or the increase of the jackpot prize. Usually, the progressive jackpot prize is connected and linked to several slot machines. Each game played on any of these progressive slot machines increases the jackpot with a percentage of the wager you put in the game. 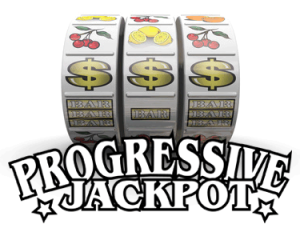 When you get the highest combination of the game, you win the progressive jackpot. The jackpot prize then reverts to its minimum preset level and starts to “progress” once more, until another player wins. The progressive slots are among the most popular games in any online casino and the jackpot prize linked to these machines is proportional to the wager amount of the machines. It is very important that the players understand the instructions of the game as there are minimum wagers in order to be eligible for winning the jackpot. Most slot machines are considered progressive slots as you can find that nearly every machine is linked to a huge prize to make the game more interesting for the players to participate in. There are a number of things you should look for when you are choosing the progressive jackpot slot machines. • First of all, you should check the software provider of the game. Microgaming, Playtech and Cryptologic are among the most well- known casino game software providers. If you are gambling with games released by these companies then you can be sure that you are competing against fair “in-house” and this means that you have a good chance of winning. • It is very important that you also understand the instructions of the game and its terms and conditions. This does not means that you will spend half the day learning how to play but you do need to know the highest and the strongest winning combination and the minimum wager that makes you eligible for the jackpot prize. Progressive slots differ from the non-progressive slots in just one thing. In non-progressive slot machines the jackpot prize is fixed and you get the same amount every time you get the highest combination of the game. It is a tempting experience and that’s what makes many players join the progressive slot games every single day. Take your chance and try your luck with one of the progressive slot machines.